Mature sporangia of Gymnocarpium dryopteris, the Oak Fern. 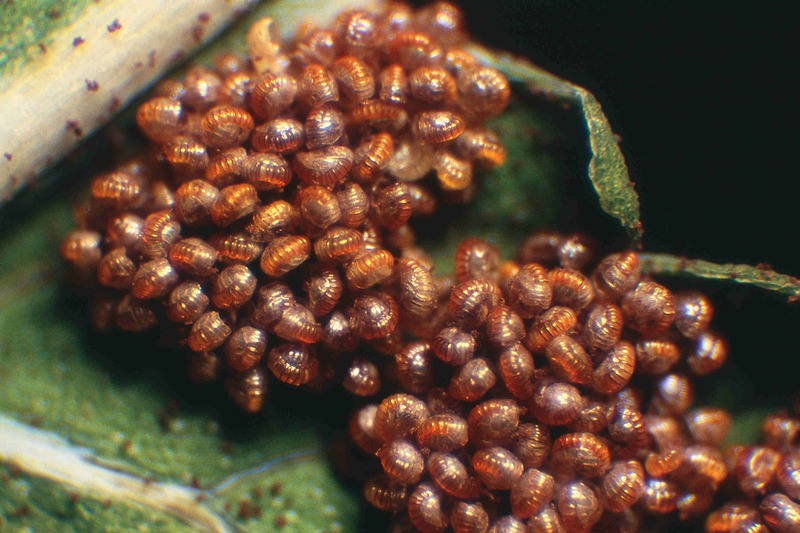 A sorus is a cluster of sporangia (the ribbed capsules) developing on the back of a fern frond. Each sorus looks like a dot to the naked eye. The field of view of the photo is 2.5 mm wide. 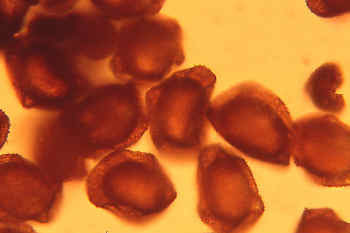 The sporangia of the Oak Fern mature in late summer and each one releases about 60 spores. Collected on Poot's Peak Trail, Kachemak Bay State Park, near Homer, Alaska. Spores of the Spreading Shield Fern, Dryopteris dilatata. These spores are about 50 micons long, about half the thickness of a hair. Photographed in yellow light. Kachemak Bay State Park, near Homer, Alaska. 24 July, 2004 . 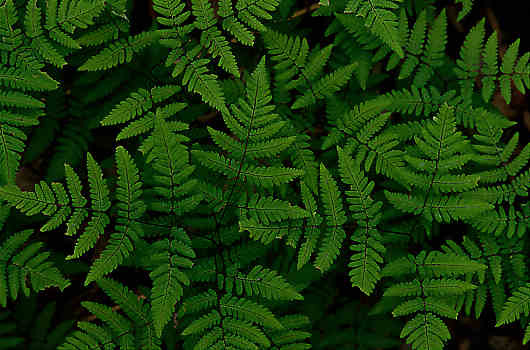 Ferns and their "allies"are spore producing vascular plants loosley referred to as "pteridophytes" This term refers to three distinct Divisions (phyla) of Plants: Horsetails, Club mosses, and Ferns. These plants share some basic traits. They all have well developed vascular systems and are free sporing. Unlike the mosses, the most prominent generation of these plants is the sporophyte, the spore producing generation. The first vascular, spore producing plants occur in the fossil record about 425 million years ago. Paleobotanists remain uncertain about the exact evolutionary sequence and ancestral relationships of present day horsetails, club mosses and ferns, but agree that the major lines diverged by about 375 million years ago. Many species abundant in the fossil record, such as tree-sized lycophytes and tree ferns, thrived in the swamps of the Carboniferous period, but have become extinct. Equisetum (horsetail fern), is probably the oldest living genus of any plant, having survived unchanged for the last 300 million years (Raven, Evert, and Eichorn,2003 ). Although the club mosses, horsetails, and ferns do not look alike they do have, in general terms, the same type of reproductive cycle. The haploid gametophyte, which grows from the spore, is seldom over 1 cm across and is rarely observed because it is small and generally grows underground. The sporophyte, the large "leafy" plant that we identify as the fern, horsetail, or club moss springs from the embryo formed by the underground gametophytes. 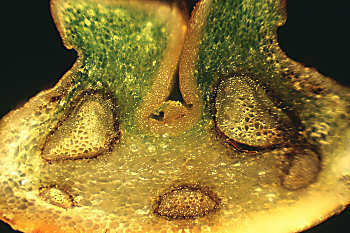 In many pteridophytes the little gametophyte dies once its sporophyte develops. The sporophyte remains as the easily recognizable plant that we are familiar with. The uncoiling fiddleheads to the left are the sporophytes of a fern Dryopteris dilatata, the Spreading Shield Fern, common in moist shady woods in most of the northern hemisphere as well as much of Alaska. The meaning of the botanical names included with many of the photos have been mainly taken from The Names of Plants by David Gledhill, a very useful book. I have occasionally consulted Gardener's Latin by Bill Neale. Merriam Webster's Collegiate Dictionary is also a good source for the etymology of plant names .